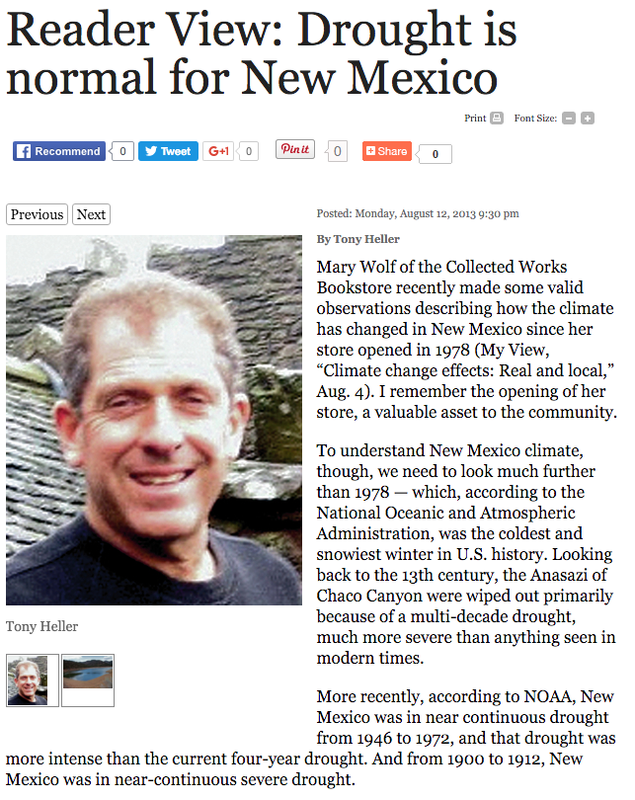 I wrote this article for the Santa Fe newspaper in 2012, pointing out that the New Mexico drought was normal cyclical behavior, and that the rains would return. As predicted, the rains did return and the past three years in New Mexico have been unusually wet. Why do you keep dwelling on the facts? Doesn’t sell advertising time like fiction does. I saw a funny banner headline lead news story on local Bakersfield TV this morning while doing the treadmill at the gym; “Bakersfield Summer This Year Will Be Hot and Dry”. But this is the same reporterette who yesterday said with a straight face, “The shooter opened fire and started shooting”. I am temped to switch over from Fox and Friends and watch her comedy routine. I’m sorry, that is not on, but tomorrow will be a heavy snowstorm in Colorado. Hey Tony! Really nice article! Concise, clear and accurate — just as worth reading today as it was in 2012. Thanks! Tony Heller the rain maker. What a “lucky” guess ? 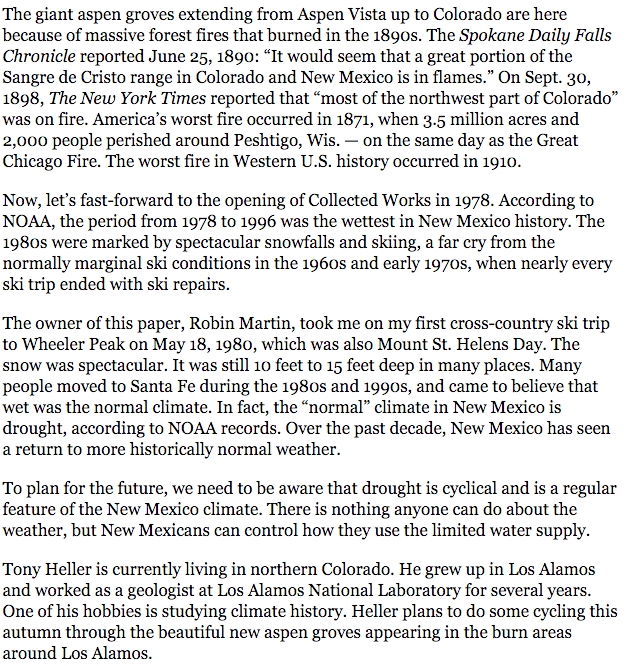 And I predicted the same in, 1979, the first year that all climate Science began (Before then, only Climate Prophet’s were allowed to predict the Weather, but then (1979), by sheer Devine Province, Climate Scientist Kathy Hey-Hoe (Who is a “very” well respected Scientist and considered a prodigy of the Greatest Climate Genius of all time, Joseph Stalin) forecasted that New Mexico would soon become a Desert State, which is what it is, because New Mexico is located in the Desert South West, but before then (1979), New Mexico was considered “Semi-Arid” Desert State, because the New Mexico Ski Resort, Taos, had not yet formed, causing everyone to exodus to Breckenridge, Colorado, where Skiing began (April 1, 1979) ! But now it doesn’t Snow in Colorado anymore (Those poor kids, growing up not knowing what Snow is anymore? ), so all the Skiers and Ranchers flocked back to Toas, and built the City of Toas!